by Bill Dwight on Friday, April 27, 2012 at 7:33 PM | LEAVE A COMMENT! 1. What purchases do you expect your child to cover? B. Contributions to long-term savings goals like college or a car. D. Specific “needs” like clothing or school lunches. 2. What are appropriate income sources for your child? A. Occasional windfalls like found change, tooth fairy payments, and birthday/holiday money. III. a variable amount calculated based on chores completed. C. An expense allowance to cover specific “needs” like clothing or lunch money. D. Occasional payments for extra odd jobs around the house. E. Payments for odd jobs outside the house — like babysitting, mowing lawns, dog/cat sitting, etc. F. Compound interest or matching contributions as an incentive to save. How’d that go? Were you able to mentally check off the boxes that make sense for your child and your family situation? If so, setup will be a cinch. Even if you aren’t sure about some of the options, you can just ignore those ones for now. Start simple. Start with what you know. You can always go back and fine tune your virtual bank settings afterwards as your thinking evolves, your child matures, your family situation changes, your parental experiments flop, whatever! Now that you’re equipped with your checklist, let’s walk through the setup. Would you like to use our prepaid card accounts with your kids? At least four cards come with your subscription at no extra charge, and I highly recommend the cards for eligible families. They’re super convenient, widely accepted, and safer than cash. Kids love the responsibility, and parents love the fact that there’s no risk of overdraft or debt. Interested? Jump over to our post on getting started with your FamZoo prepaid cards to learn how to complete your initial bank setup with prepaid card acsounts. 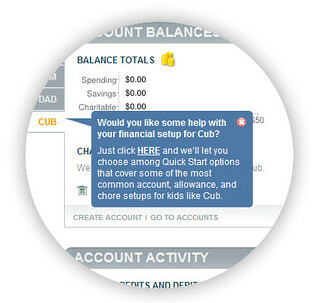 Otherwise, if you’ll be using our IOU accounts with your kids to track money that you’ll be holding elsewhere, just look for the blue bubbles that appear on the Overview page right after you finish registering your family. They’ll lead you through adding your family members and completing your initial bank setup. Fill in the blanks to match your child’s situation. 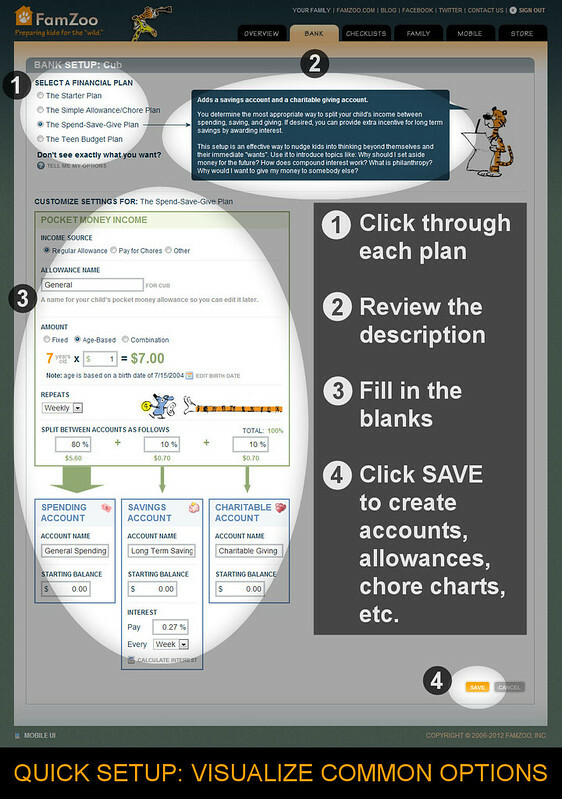 Click Save to create any accounts, allowances, and chore lists associated with your choices. Hopefully, you’ll find the setup pretty self explanatory — please let us know if you find otherwise! But just in case, this cheat sheet graphic shows where to look on the setup diagrams for each option listed on the survey at the top of this post. Having trouble? Don’t see an option you need for your family? Need a more sophisticated setup? Don’t hesitate to contact us, and we’ll give you a hand. Here are some sample Virtual Family Bank setups that might give you some inspiration. Steal the ideas you like, and tweak the settings to match your family’s unique situation. by Bill Dwight on Thursday, April 26, 2012 at 6:31 PM | LEAVE A COMMENT! You have 5 kids, how do you balance your family life with your startup life? FamZoo recently landed a spot next to Kickstarter and Foursquare in Doreen Bloch’s book, The “Coolest Startups in America”. 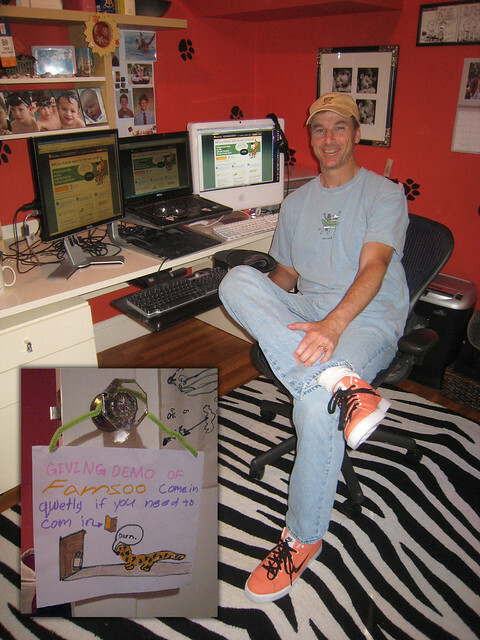 Can you give us some insight into what makes FamZoo so cool? What’s the most surprising thing you’ve encountered since launching FamZoo? 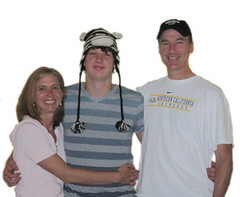 What sparked the idea for FamZoo? What’s the smartest move you’ve made since launching FamZoo? What is your favorite feature of FamZoo? You won Best of Show at FinovateFall last year as a first-time presenter. What advice would you give a startup preparing for their first Finovate demo? Can you give us a sneak peek of what’s next for FamZoo? What do FamZoo’s user numbers look like? by Bill Dwight on Monday, April 09, 2012 at 11:33 PM | LEAVE A COMMENT! Do you deliver financial products or services to a family audience? Would you like to associate your brand and your offerings with innovative and effective youth financial education? Then take a look at FamZoo’s Partner Edition product. It allows you to embed your custom content within our award winning Virtual Family Bank. 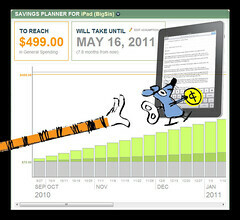 Every time your families interact with our application to teach kids good personal finance habits, they’ll see your brand, your related product/service offerings, your educational content, your latest social media streams, you name it — all at just the right time and in just the right context. Schedule an unlimited number of targeted content snippets. Place the content in a variety of locations throughout the application — across the top of our pages, in different positions along our sidebar, and even at the top of automated FamZoo emails to your audience. Use any HTML markup you’d like for your content — anything from just simple images to sophisticated social media widgets. Schedule your content for a specific date range of for ongoing display. Target your content specific audience segments. So how does it work? Here’s a specific example: Suppose you’re the Director of Online Marketing for the hypothetical XYZ Credit Union, and you’d like to offer a teen checking account product to your member parents who have a child approaching the target age. Your desired ad might look something like the one to the right. To create, schedule, and manage your custom content, you’ll need to sign into your private Partner Edition administrative console. We send you the credentials for your first administrative user when your partner edition account is activated. You can subsequently change those credentials and add as many addition administrative users as desired. Once you’re in the admin console, click on the Branding tab. This is where you’ll find most of the features for adding your own custom content. Click on the Sidebar Ads link in the Viewing section of the left-hand sidebar to see a listing of any custom sidebar content you’ve created so far. The name of the ad as you’d like it to appear on the listing page of the admin console. The title of the ad as it should be displayed to the end user. The HTML markup for the body of the ad. The preferred vertical position of the ad within the sidebar, if any. Whether or not the ad should be shown to a sub-segment of the audience — like “just parents with children ages 13 and up” in this case. Where in the application this ad can be shown — either all pages, just the pages on a specific tab, or just a specific page in the application. The specific date range for the ad if there is one. 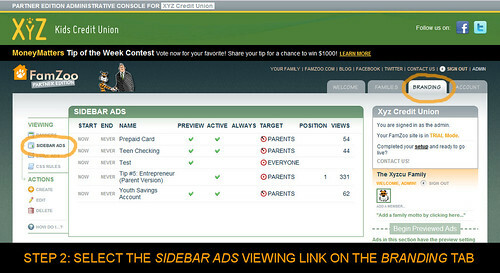 The advanced option for indicating that this ad takes top display priority among other candidates if desired. This setting can be handy when you have multiple ads vying for a given position, but you want one to dominate. Normally, FamZoo will rotate display through all of the matching candidate ads for a given position. When checked, this option overrides that normal rotation and always gives precedence to the specified ad. It’s a good idea to test your ad to make sure it’s displaying properly before unleashing it on your audience. When creating or editing your ad, select the Preview option to have it display in the special preview section of the sidebar within the admin console. 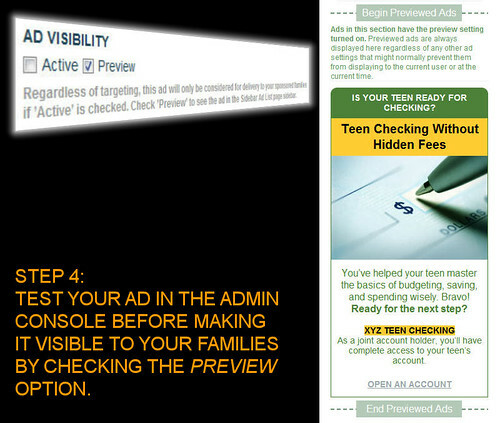 Once you’re happy with your ad, check the box next to the Active option, and it will be displayed to your family members when it matches the specified conditions. That’s all there is too it! 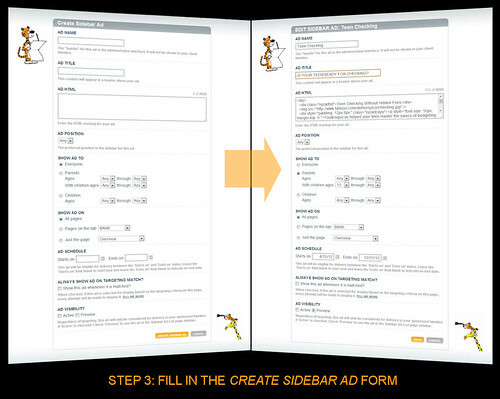 The steps for scheduling banners and email ads are very similar and just as easy. That said, if you ever have any questions, we’re always eager to help. Just contact us. 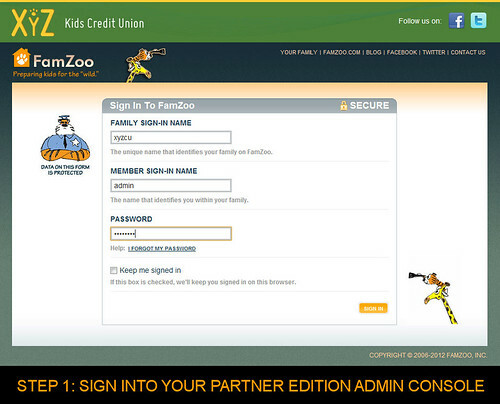 How to Deliver Youth Financial Education with FamZoo Partner Edition. Written specifically for Credit Unions, but 99% relevant to all partners. So your best buddy just became a dad, and you’re looking for that special guy-centric something to commemorate the monumental event. Of course, you could go with one of the classic standbys: a box of cigars, a six-pack of beer, or something else to dull that vague sense of foreboding. Instead, maybe you should try something that will actually help your buddy successfully navigate his new-found responsibility, rather than blunder through it blindly. Stumped? Puzzle no more. I’ve got just the answer: Treion Muller’s new secrets-of-fatherhood handbook: Dad Rules: A Simple Manual for a Complex Job. Blissfully short: It’s 81 quick pearls of wisdom, each of which fit easily on a single page in big type no less. Simple to understand: Each nugget of advice is easily digested. No big words. No fancy concepts — unless you count the occasional pithy quote from some old dead wise person, but those are optional. No required reading order: Skip around. Read one rule here, one rule there. Re-read a handful from time to time. They’re largely independent, and cross-referenced when related. Immediately actionable: That’s the best part. You can read a simple rule, take it to heart, and go make it happen with your kids right away. No assembly required. Maintain consistency between your thoughts, words, and actions. One of those pithy quotes Treion passes along is this gem from Gandhi: “Happiness is when what you think, what you say, and what you do are in harmony.” It feels so right and so good when you actually say what you’re truly thinking and, further, when you actually do what you say. You know you should be a good dad. You say you want to be a good dad. Dad Rules helps you do just that. Similarly, in our life skills niche: You know you should teach your child good money habits. You say you want to teach your child good money habits. FamZoo helps you do just that. Following through effectively does indeed bring great happiness. This question is the precursor to some of the greatest moments in your life. Don’t miss out. And, remember, one of the most valuable things you can give your child is your undivided attention. 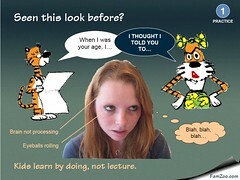 Rule 45: If you feel the urge to lecture, stop and think about it first. Kids learn by doing, not lecture. ’Nuff said. 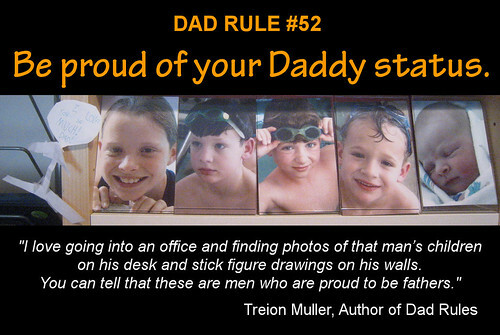 Rule 55: Raise children, not clones of you. It’s OK to reinforce your core values, but embrace and encourage your child’s natural diversity along the way. Rule 68: Establish a healthy dose of family traditions. Rule 70: Make your kids work for their rewards. I call this is the “anti-entitlement” rule. In a world of excess and limitless material possessions, our children are sometimes victims of overindulgence and feelings of entitlement. “I want” and “I get” are often synonymous. They ask, and we give. Beware! This seemingly innocent practice just feeds into an already growing culture of entitlement. If you love your children, make them work for their rewards. That rounds out my top 5 favorite dad rules. I’m sure you’ll find a bunch that hit home with you and your family. You’ll also undoubtedly find a handful that will give you pause and make you think: “Man, I really need to start doing that with my kids!” I did, and I’m no spring chicken when it comes to the fatherhood gig. So, if you have a buddy who is taking the plunge into parenthood, grab him a copy. He’ll appreciate it. Who knows? Someday Dad Rules may even unseat beer as the most popular baby shower present for dads. Well, OK, no reason you can’t get him both. I suspect they go pretty well together. by Bill Dwight on Tuesday, April 03, 2012 at 6:32 PM | LEAVE A COMMENT! Would you like to partner with us to deliver innovative, effective youth financial education to your audience? Would you like to grow your audience and your sales along the way? FamZoo offers a variety of ways to partner, a spectrum of price points (including free), and multiple revenue generation options. The following table (nice PDF version here) summarizes 6 different partnering scenarios based on two dimensions: family sponsorship level (none, partial, or full) and branding option (FamZoo brand or co-branded). FAMILY SPONSOR LEVEL None Partner does not pay for any family membership fees. Family pays for all membership fees after 2 month free trial. 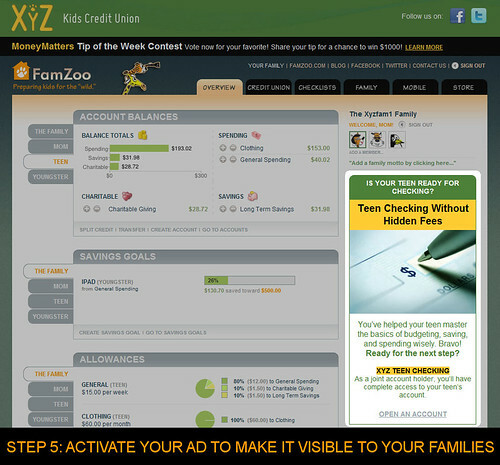 You tell your families about teaching good money habits with FamZoo. We share initial family subscription and ongoing renewal revenue with you. You connect with the next generation. You keep your brand in front of parents for years while you help them teach their kids — your future members, clients, customers — good personal finance habits through hands-on practice. You bolster your brand. You associate your brand with effective youth financial education, social responsibility, innovation, and a good ’ole warm family feeling. You increase cross-selling opportunities. You present your related content, products, and services to just the right audience at just the right time. Family pays for any renewals after initial sponsored subscription. 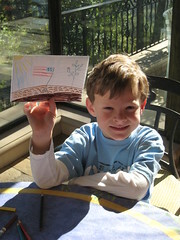 You help families get started with good money habits by sponsoring their initial subscription. We share FamZoo renewal revenue with you. Family subscribes and renews annually for free. FamZoo/Partner revenue sharing is not applicable. You help families develop and sustain good money habits by sponsoring their FamZoo membership for as long as they need it. FamZoo shares 25% of family subscription and/or renewal revenue with partner. Discounted bulk family subscription/renewal pricing starts at $15/family/year (50% off best list price). Discounts increase with volume. Annual admin fee is proportional to partner size and ranges from $200 to $3,000. NOTE: Annual admin fee can be eliminated with our “static branding” option. All prices mentioned here are for general informational purposes only and are subject to change at any time. To obtain formal pricing for your specific situation, please contact us. This is a very popular choice for bloggers, and it’s completely free for you, the partner. Just surround FamZoo with relevant, compelling content — like blog posts, videos, podcasts or curriculum that describe how your niche audience can get the most mileage out of our Virtual Family Bank. 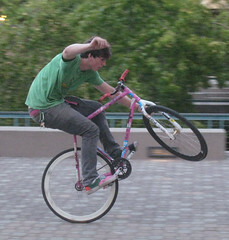 Embed our affiliate links in your content to direct your audience to our site for registration. If a family converts to paid after our standard 2 month free trial, you share in 25% of the initial subscription revenue as well as 25% of any ongoing renewal revenue down the road. Those renewals can turn into a nice little annuity (with no extra effort), because most families use FamZoo for several years. Family finance blogger Suzanne Parker sets a great example. 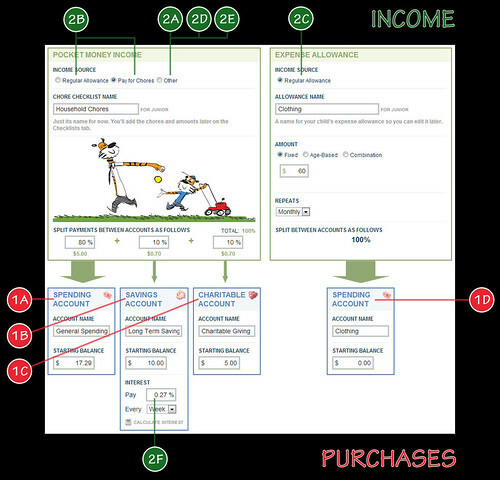 Her top notch content over at GrowingRichKids.com includes detailed online allowance site comparisons and FamZoo best practices drawn from her own genuine experiences with our product. Suzanne’s families know exactly what to expect when they sign up for FamZoo, and they trust her judgement. As a result, Suzanne yields an impressive 38.3% conversion rate of free trial families to paid subscribers. That’s better than the conversion rate we see on our own site, and it’s a testimonial to the power of a well-targeted and well-informed audience. If you’d like to take it to the next level of value for your audience, consider sponsoring the initial subscription period for your target families — or perhaps just a segment of them. How? You can purchase a discounted basket of prepaid subscriptions from us to hand out to your audience in the form of custom coupon codes. For example, you might run a special promotion during April to commemorate National Financial Literacy Month. You could hand out a coupon code called MYFINLITPROMO that’s redeemable by up to 100 different families for one free year of FamZoo membership. After the sponsored term is up, each family has the option of renewing as a paid subscriber. You share 25% of any such renewals, just like in Option 1. Taking it up one more notch on the value scale for your families, you might even choose to fully sponsor their memberships — perhaps as part of a non-profit educational initiative. In this case, you pick up the (discounted) fees for the initial subscriptions as well as any subsequent renewals. Note: families must explicitly renew each year by clicking through an acknowledgement screen; this prevents you from continuing to pick up costs for a family who has since graduated from FamZoo. Option 4 is just like Option 1, where we share all the family membership revenue with you, but you also get co-branding and cross-selling capabilities. The Co-Branding Option allows you to infuse FamZoo with your brand and your targeted content — ads, special offers, social media streams, educational material, you name it. You customize the look of our application with your brand, schedule your targeted content, and monitor the activity of your families through your own private administrative console. The administrative console is completely self-service, so you maintain full control over your marketing initiatives — no waiting for our intervention. That said, we’re always available to give you any help or guidance you might need along the way. To gain access to your administrative console, you pay us a one-time setup fee and an annual admin subscription fee. Both of those fees are proportional to the size of your organization. If you’d just like to set up your co-branding and targeted content once and forget about it — and if you’re happy to forgo access to your administrative console — we’ll drop the annual admin subscription fee. We call that the “Static Co-Branding Option”, and you only pay the one-time setup fee. Most partners who have their own products and services to sell choose the Co-Branding with either this option, Option 5, or Option 6, depending on how important revenue sharing is for their youth financial education business model. Option 5 is just like Option 2, where we share the family renewal revenue with you and the initial family subscription is your treat, but you’re also promoting your brand and cross-selling your offerings with the Co-Branding Option described in Option 4. Most financial institutions pick either this option, or the next one. And lastly, Option 6 is just like Option 3, where you’re treating your families to FamZoo subscriptions and renewals, but you’re also promoting your brand and cross-selling your offerings with the Co-Branding Option described in Option 4. Need help deciding which option makes the most sense for your situation? Need a private online demo? Just contact us and we’ll walk you through it. Need a formal pricing quote good for 30 days? Contact us.